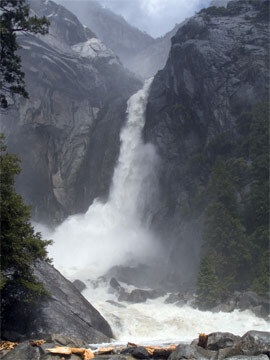 This Web site contains information for visitors to Yosemite National Park in the Sierra Nevada of California, USA. I have tried to emphasize on this Web site information that would be most important and useful for visitors to have in hand well before arrival at Yosemite. The factual information on this site comes largely from documents published by the U.S. National Park Service, part of the U.S. Department of the Interior; by the non-profit Yosemite Conservancy in cooperation with the National Park Service; and by Yosemite Hospitality LLC, a subsidiary of Aramark, an authorized concessioner of the National Park Service; and distributed to visitors arriving at Yosemite and to everyone by means of the World Wide Web.